Built like a tank, with sturdy, stainless steel components, the Schwinn® IC Pro Indoor Stationary Cycling Bike will get you going someplace fast. Since 1895, Schwinn® has produced the highest-quality American bicycles – and that tradition extends to the work-horse model IC Pro Indoor Cycling Bike. The IC Pro offers indoor riding adventurers an infinite range of resistance settings, employing a state-of-the-art linear, incremental system to achieve this. With corrosion-preventing stainless pins, and a corrosion-resistant frame and finish, you never need to worry about rusting or deteriorating parts: it's a bike that's built to last. And unlike other stationary machines, the IC Pro comes with two composite water bottle cages that hold containers up to 1-liter in size. 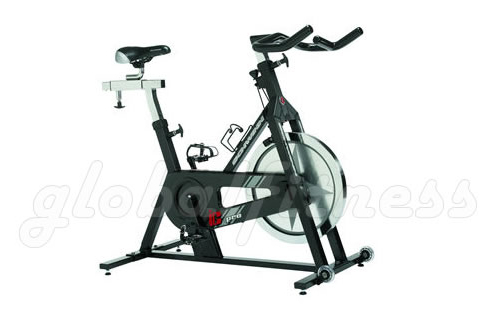 Weighing in at only 130 lbs the sturdy IC Pro Indoor can accommodate riders of up to 300 lbs. Its sleek, sliver frame color will stimulate your need-for-speed, ensuring that you get the full benefit of every challenging workout. The IC Pro is a traditional, reliable, chain-driven cycle, yet it comes with an enclosed chain guard that keeps lubricated parts away from the rider, while allowing easy access for additional lubrication when needed. Finally, the easy-to-use handle-bar and seat adjustments keep you cranking in comfort for as long as you can go. Dimensions: 50" X 22.5" X 39"